The CopperHeart integral collector storage system, or ICS, combines thermal collection and storage in a single unit. The CopperHeart is engineered to meet the international demand for a simple, durable and inexpensive domestic water heating system. 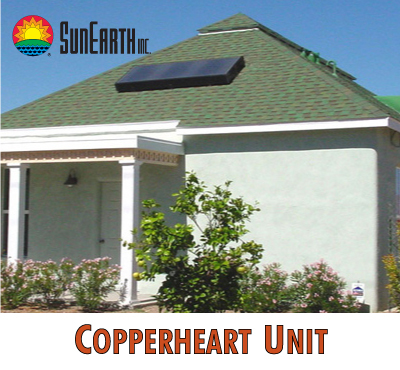 The retrofit CopperHeart installation typically serves as a solar preheater to the existing electric or gas water heater. For new construction the backup heater of choice is most often a compatible gas or electric tankless water heater. In non-freeze climates the CopperHeart may be used as the primary water heater. For durability, reliability and simplicity of installation and operation the CopperHeart ICS has no peers. If properly installed and maintained the CopperHeart ICS can safely be deployed in areas that experience occasional mild freeze conditons. SRCC Rated Freeze Tolerance: 20° F for 18 hours. Gross area: 12.6 sq. ft.
Net aperture: 10.6 sq. ft. The Solar Rating & Certification Corporation OG-300 systems level rating is an independent assessment of both system reliability and performance. Systems that receive this rating must meet HUD minimum property standards in addition to a rigorous review performed by SRCC staff and design review team. Once the system has passed these quality assurance checks it undergoes a full performance analysis to estimate the actual solar contribution of the system towards an average hot water load. This contribution, as defined by the Solar Energy Factor is listed alongside the different variants of each system type. Benefits of Solar: A properly sized ICS Solar Water Heater system will raise water temperature as high as 140+ degrees. In addition to heating the water, your hot water reserves can be increased by as much as 50 percent, if the system is combined with a conventional or instantaneous gas or electric heater serving as a backup unit. Other benefits include increased equity in the home, a 25% return on your investment, plus the BONUS of hot water during power outages! As with all solar water heaters, the total amount of solar contribution to the system is dependent upon the hot water consumption pattern, daily weather conditions, and variable amounts of available sunlight throughout the year.